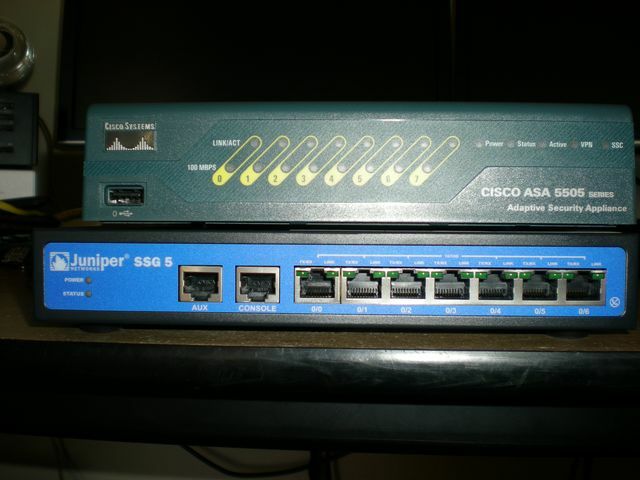 I thought it was about time I did proper review of the Cisco ASA 5505 and the Juniper SSG 5. Both devices are at the low end of firewall security devices offered by Cisco and Juniper. 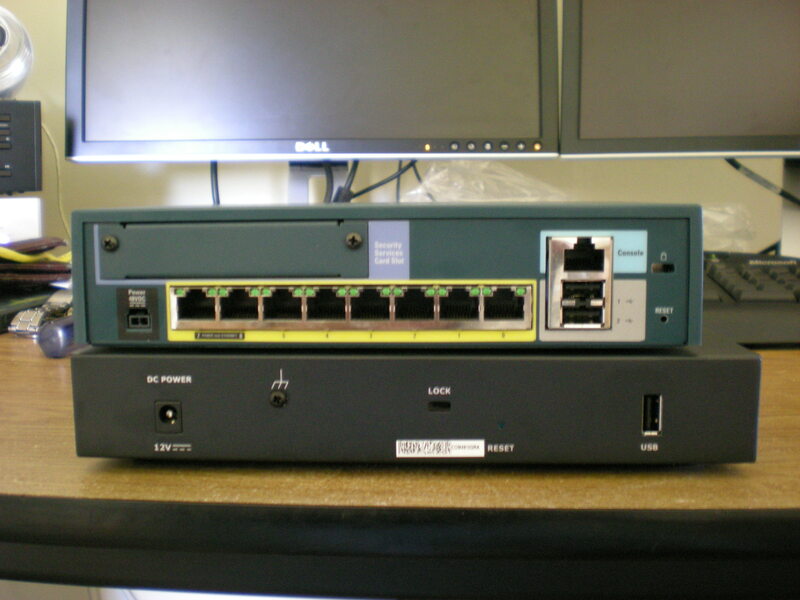 The ASA 5505 is part of Cisco's new range of Adaptive Security Appliances (ASA) the replacement for the PIX. The 5505 replaces the old PIX 501 and 506e. The SSG 5 is Juniper's lowest end Secure Services Gateway (SSG). The SSG 5 replaces the old Netscreen 5GT. There are many models of the SSG 5 and ASA 5505 available, for this review I will be looking at the non wireless SSG 5 256mb version and the unlimited user ASA 5505 K9 version. Before we get started I should make it clear that I work with the Juniper range of hardware every day; so I may be bias. The first thing I'll do is compare the two devices "on paper". ** IMIX traffic is more demanding than a single packet size performance test and as such is more representative of real-world customer network traffic. The IMIX traffic used is made up of 58.33% 64 byte packets + 33.33% 570 byte packets + 8.33% 1518 byte packets of UDP traffic. So on paper the ASA 5505 has much better throughput and general hardware specifications, yet the SSG 5 supports more VPN tunnels, VLANS and has full UTM (Unified Threat Management). The ASA 5505 is also about 50% more expensive (based on the retail prices), saying this wholesale prices of the two devices only differ by about $250 ext GST. The 90-Day software download for the Juniper device means that you can have to the latest software when you first purchase the device. Unfortunately this time period starts from when the device leaves Juniper. So if you purchase the device from a reseller the software update period may have already expired. This is still better than Cisco that requires you to purchase a SmartNet agreement before you can download anything. The 90-Day Cisco hardware warranty is also a bit rude. Out of the box the ASA is setup with Ethernet0/0 being the WAN side while the rest of ports are setup as the LAN side. The default IP address of the box is 192.168.1.1. If you're running an internet connection where an ip address is handed out via DHCP then the ASA will give you basic internet access straight off, although most of the time you'll want to configure PPPoE or something. 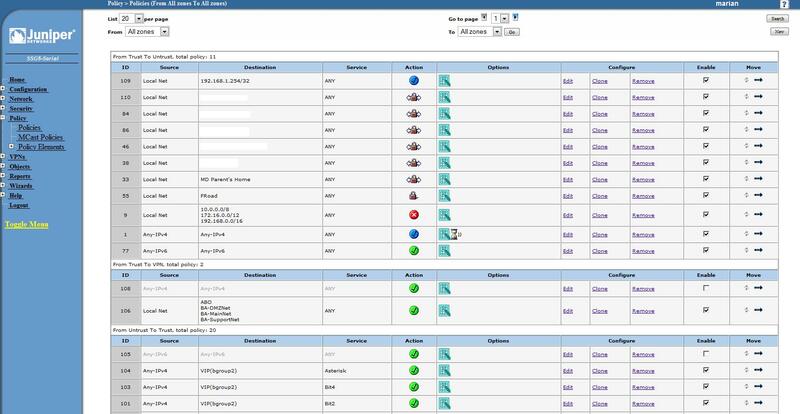 For users who have not used Cisco gear before then the easiest way is through ASDM (Adaptive Security Device Manager), cisco's GUI setup interface. To access this browse to https://192.168.1.1/ and download the ASDM. Once started you are greeted with some statistics of the ASA. ASDM is up to version 6 and is it now fairly comprehensive; if you don't like the command line then most of the configuration can be done here. By default the ASA blocks and filters certain traffic for example ICMP is blocked. Out of the box the SSG 5 is setup with Eth0/0 being the WAN side, Eth0/1 being the DMZ and the rest of the ports being the LAN side. The default IP address of the box is 192.168.1.1. The SSG 5 uses zones. "A security zone is a collection of one or more network segments requiring the regulation of inbound and outbound traffic via policies. Security zones are logical entities to which one or more interfaces are bound." So what Cisco call VLANs (or Security Levels) are basically what Juniper call Zones. The SSG is managed through a web interface this can be found at http://192.168.1.1 (default username and password: netscreen). Once you've logged in you are greated a general overview of the device. Like the cisco device the SSG also allows configuration via the command line; although the WebUI is much more complete than the Cisco ASDM. Personally I do most of my configuration in the WebUI. 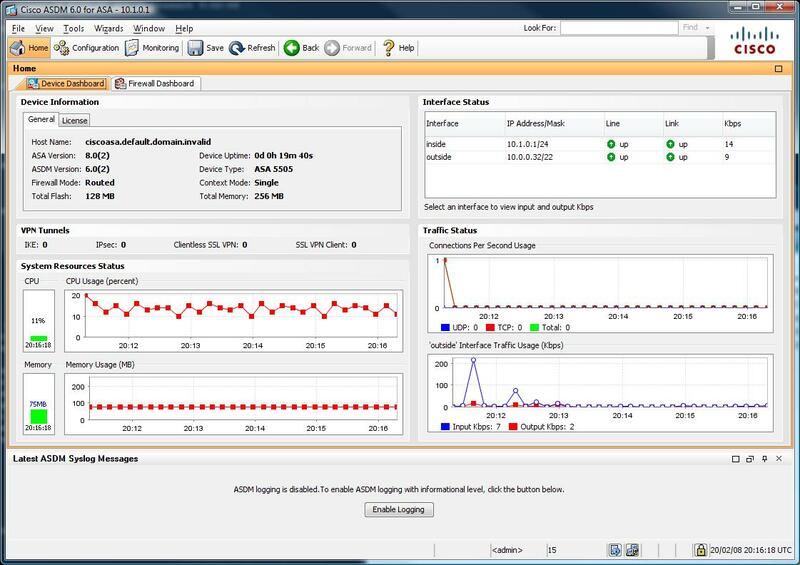 By default all outbound traffic is allowed and the WAN interface (or Untrust as Juniper call it) is set in NAT mode. The Untrust interface isn't setup to receive an address via DHCP by default. The physical construction of the 5505 is very good. The outside casing is mostly plastic, while the base of the system is metal. The only point of concern is the power connector; it seems a bit flimsy and could be easily broken. If you open up the 5505 you can see that both the flash and ram is upgradable. The flash is just a standard compact flash card, while the ram is PC3200 DDR UB NON-ECC CL3 DIMM 2.5v or 2.6v. It looks like the ASA 5505 can support up to 512mb of Ram. The primary CPU is based on an AMD Geode chip, plus there is a hardware acceleration chip too (for VPN encryption etc). The 5505 also has a Security Services Card slot allowing extra functionality to be added on. Although there are not any cards at this stage. There are 2 USB 2.0 ports on the back and 1 on the front. Seems like a lot for a firewall! At this stage they don't do anything. The inclusion of two Power over Ethernet ports is a great idea as it allows you to simply plug an IP phone in without the need for an extra power brick. There is an internal battery that can be replaced if required. Overall the ASA 5505 feel like it was built to last. The physical construction of the SSG 5 is good, but it isn't has good as the 5505. My main point of concern is the single USB port on the back. It isn't attached to the outside casing and just feels a bit flimsy. The SSG 5 allows for the memory to be upgraded, although 256mb is the max. I tried a 512mb DDR2 SODIMM in the device but it didn't boot. It is possible that I was using the wrong type of ram (on second look it may need DDR1). The flash memory is soldered onto the board and cannot be replaced. The SSG 5 uses an Intel IXP455 chip running at 533MHz. There is a single USB 1.1 port on the back of the device that can be used for storing log files or other firmware. At the time of writing software version 8.0(3) is currently the latest version for the ASA. Unfortunately I currently only have 8.0(2), saying this the differences should only be bug fixes. The ASA software is simply a continuation of the PIX software. The configuration is stored in a single text file. With each version of the ASA/PIX software the command line configuration is slowly becoming more and more like Cisco IOS which is not a bad thing. The ASA has a stack of features for a device so small and cheap. It does everything that the PIX 506e does (IPsec VPN, SPI firewall etc) plus more (SSL VPN, EIGMP). The inclusion of SSL VPN means that this device can easily support teleworkers that may not have access to an unrestricted internet connection. 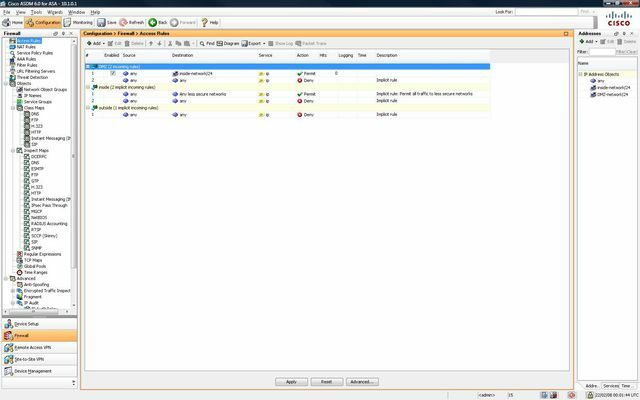 SSL VPN gives the end user an option of a client based connection (similar to an IPsec VPN) or a clientless connection (a web portal to published files and services). The ASA 5505 also provides basic routing and nat functionality, meaning that you can run this device without a separate router. Unfortunately there is no option for an integrated ADSL modem, so a modem will need to be purchased. The configuration of the ASA can be scary for new users. ASDM is not particularly well laid out. NAT rules are in a different location to access rules and everytime you want to make a change you must save and upload the configuration again. The base license is also restrictive, you are limited to three "zones": untrust, trust and dmz. You cannot create pin holes in the DMZ to allow access the the Trust network either. The SSL VPN is also very limited as you are only allowed 2 SSL VPN connections. IPsec is a little better with 10 tunnels allowed, but even cheap SOHO routers can do 10 IPsec tunnels. All of these limits can be removed or increased with more expensive licenses, but they are much much more costly. It is possible to get the ASA 5505 in 10 and 50 user versions (number of computers using the internet behind the ASA). Why Cisco have this limit is beond me. I've never seen a cheap SOHO router with a user limit. The reporting options in ASA 5505 are fantastic. If you want to know what is going on it your network then the ASA will tell you. It can display the most used services, sources or destinations in a pie chart (plus a whole stack of other options). Overall the ASA software is good, but there are far too many limits on the base 5505. ASA Software Version 8.1 is due soon although I've yet to hear what extra features it will include. 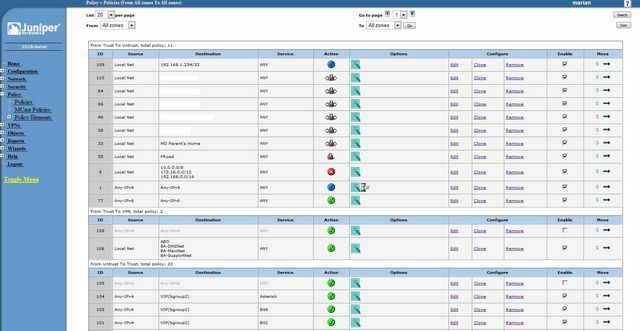 The SSG 5 came out with ScreenOS 5.4 but since then Juniper have released 6.0 and 6.1 both adding lots of extra functionality. ScreenOS supports just about any routing protocol (BGP, OSPF, RIP etc) and has some really nice features that aren't found on the ASA 5505. The base SSG 5 license supports unlimited users, 25 VPN tunnels and 10 zones. The extra zones really makes the SSG 5 stand out. For example you can have a Untrust, Trust, DMZ and VPN zone. All VPN tunnels can be bound to the VPN zone, separating it from internet traffic. There are also no limits on how the zones work so the DMZ can talk to the any zone if you so wish. With 10 zones every port on the SSG 5 can be part of a different network. So if I wanted to add a wireless access point I could create a zone that only allows the wireless users to access the internet. Policy management is also much better than the ASA. Every change made via the web interface is automatically saved. You can quickly disable policies and move them around. You can fine tune each policy. For example you might want to enable NAT on a policy, or add anti-spam scanning on certain incoming SMTP connections. The policy management on the SSG 5 feels much more mature. Again the SSG 5 like the ASA 5505 can be used as a stand alone device without the need for an extra router. The SSG 5 does have another nice option, you can purchase them with ADSL2+ modems built in (or ISDN or 56k modem). So you don't need to buy an extra modem. Saying this I find it easier and cheaper just to use an external modem as it can be upgraded if a new technology comes out. ScreenOS 6.0 added Auto Connect VPN which works the same as Cisco's Dynamic Multipoint Virtual Private Network. This basically means that in a hub and spoke vpn setup the spoke sites (remote offices) can automatically establish a VPN tunnel between each other (based on the rules at the hub) to reduce the traffic going through the hub. This can increase bandwidth and decrease latency. ScreenOS 6.1 added IKEv2 the next version of the Internet Key Exchange protocol which is used in IPsec. Just thought I'd add a quick section on the power adapter. 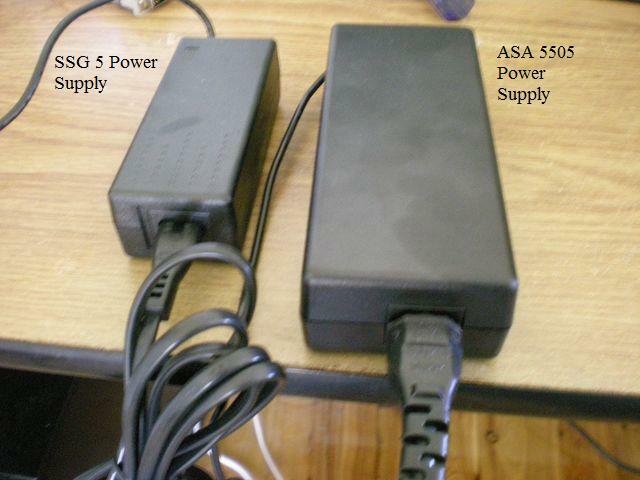 The Cisco ASA 5505's power adapter is quite large and seems to make a bit of noise (more than the device itself). Both devices are fantastic yet each have their own strengths and weaknesses. For example the SSG doesn't support SSL VPNs while the ASA doesn't support built in Anti-Virus or Anti-Spam. I feel that the ASA 5505 is a little let down by its software and licensing limits. The reporting options in the ASA are much better then the SSG, but this doesn't make up for its other short comings. SSL VPN is nice but again far too limited with only 2 connections. The ASA 5505 hardware is clearly better than the SSG 5: PoE ports, USB 2, higher throughput. On paper the SSG 5 isn't has good as the ASA 5505, yet the device is much less limited. I personally don't feel that the performance of the SSG 5 isn't an issue. These two devices are designed for small businesses and teleworkers, they're never going to see 150mbit/sec of traffic. The SSG 5 comes with many more hardware options, you can even get a version with 802.11a/b/g wireless. To me the SSG 5 makes a better router than the ASA 5505. While the ASA 5505 makes more sense for a business with teleworkers that require SSL VPN. The SSG 5 can handle more VPN tunnels (up to 40 with an extended license) and has some technology that makes it better for site to site VPNs, such as running BGP over an IPsec tunnel. If you're currently running a Cisco network stick to the ASA. Likewise if you're running a Juniper network use the SSG. For new users you need to decide on what is important to you. Do you plan on using SSL VPN? Then get the ASA 5505. If you're just using IPsec or require some more complex networks/routing get the SSG 5. Value for money? The SSG 5 is better as there are far less software limits. Hi Fabien, I still cannot see where you can download this software. The only item I can see on the url you linked that might be the software is NS-SM-S-BSE but this is listed at around $AU12,000.